I’m struggling to start this review. Goodbye First Love isn’t a film I’d usually rush out to see so I can’t say much about my expectations. As wide as my range of film-watching is and as much as I love a good indie or art-house film, I often struggle with more gentle, stately paced relationship dramas like this. It’s not that I dislike them as such, but they rarely fully click with me enough to get me excited about watching them. For whatever reason I thought I’d give this a try though when the kind folks at Artificial Eye offered it to me to review. Goodbye First Love tells quite a simple story. 15 year olds Camille (Lola Créton) and Sullivan (Sebastian Urzendowsky) are deeply in love. However, Sullivan is not happy with other aspects of his life and longs to ‘find himself’ by travelling the world. With Camille more indebted to her studies, she chooses to stay put in Paris whilst Sullivan heads off to South America for 10 months. They spend one last summer together, staying in a remote countryside cottage before they part. They stay in touch through letters, but these become more sparse as Sullivan ends up staying longer there than planned. One final letter puts an end to their relationship which devastates Camille for a number of years. After a long while she finds solace in her new vocation as an architect and falls for her teacher Lorenz (Magne-Håvard Brekke). Seemingly happy in her new life 8 years on from that first love, Sullivan makes a reappearance and the two of them try to rekindle the flame that had never quite gone out. Writer-director Mia Hansen-Løve lets things play out very simply and naturally. Dramatic moments like a suicide attempt and miscarriage are never lingered on or overwrought. What she is concerned with are the underlying emotions that remain in memory as well as the beauty and pain of young love. The first third of the film when we witness the couple together as teenagers is where the film really shines. Hansen-Løve captures the essence of this beautifully. Although there are (possibly a few too many) romanticised moments with Camille and Sullivan frolicking in the countryside and communicating via letters, in general the natural style shines through. The passion, difficult mixed emotions, immaturity and purity of teenage infatuation is perfectly handled. The performance that is drawn from Créton is wonderful too and you’re always fully bought into her character and relationships, even if she doesn’t look to have aged during the 8 year span of the film’s chronology. The film did lose me a bit in the second half though. With such subtlety and lack of narrative or dramatic drive, the languid pace is difficult to stick with. Plus I never got the same kind of warmth from the relationship between Camille and Lorenz as I did with her and Sullivan. I guess that’s intentional, but she is supposed to love Lorenz, just in a different way and the nature of how their relationship began as well as the age gap felt a little ‘wrong’ to me. The eventual reconciliation of Camille and Sullivan didn’t have the emotional impact I think it required either. So it’s a tough one to judge. The approach to the subject matter is admirable, with an effectively gentle look at young love and its importance and impact, but perhaps it is too gentle to ever truly get under your skin. As beautiful as much of it was, I never got the sense of poignancy I felt the film aimed for and ironically, for a film about the strength of memories, it wasn’t all that memorable. 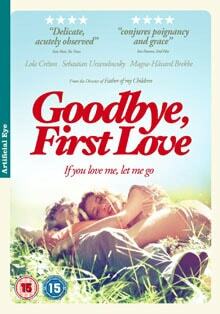 Goodbye First Love is out on 10th September on Blu-Ray & DVD, released by Artificial Eye. I was sent a basic screener so can’t comment on the picture or sound quality. This didn’t have any features either and I haven’t seen confirmation on features for the final release.